Qalculate! is a multi-purpose cross-platform desktop calculator. It is simple to use but provides power and versatility normally reserved for complicated math packages, as well as useful tools for everyday needs (such as currency conversion and percent calculation). The project consists of two components: libqalculate (library and CLI) and qalculate-gtk (GTK + UI). The study involved only the libqalculate code. Considering it subjectively, there are more errors in it and they are more critical than in the Windows calculator code. Nevertheless, I would recommend making conclusions on your own, having read this code overview. 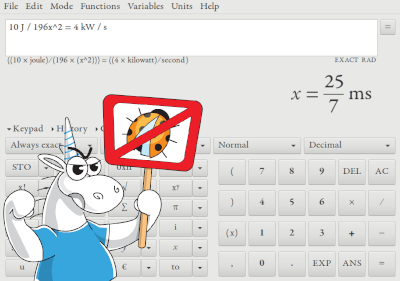 By the way, here's a link to an article about the check of the calculator from Microsoft: "Counting Bugs in Windows Calculator". The analysis tool is the PVS-Studio static code analyzer. It is a set of solutions for code quality control, search for bugs and potential vulnerabilities. Supported languages include: C, C++, C# and Java. You can run the analyzer on Windows, Linux and macOS. The code is absolutely the same in the if and else blocks. Adjacent code fragments are very similar to this one, but different functions are used in them: internalLowerFloat() and internalUpperFloat(). It is safe to assume that a developer copied the code and forgot to correct the name of the function here. In this case, duplicated expressions appeared due to the fact that in one place mtr2 was written instead of mtr. Thus, a call of the mtr.number().isReal() function is absent in the condition. We would have never found defects in this code manually! But here there are. Moreover, in the original file these fragments are written in a single line. The analyzer has detected a duplicated expression vargs.representsNonPositive(), which may indicate a typo or, consequently, a potential error. Here's the entire list of suspicious places, which one can barely puzzle out. In the inner loop, the i2 variable represents a counter, but due to a typo an error was made — the i variable from the outer loop is used in the loop exit condition. 3 years ago after I got an eyeful of such code, I wrote a cheat sheet for me and other developers: "Logical Expressions in C/C++. Mistakes Made by Professionals".When I come across such code, I make sure that the note hasn't become less relevant. You can look into the article, find a pattern of the error corresponding to the code, and find out all the nuances. In the case of this example, we'll go to the section «Expression == || !=» and find out that the expression i2 == COMPARISON_RESULT_UNKNOWN affects nothing. In one function the o_data pointer is dereferenced both without and with a check. This can be redundant code, or a potential error. I'm leaning toward the latter. The memory for the remcopy array is allocated and released in different ways, which is a serious error. The m variable in the function is passed by reference, which means its modification. However, the analyzer has detected that the code contains the variable with the same name, which overlaps the scope of function's parameter, allowing for loss of changes. The analyzer warns that the code calls a method of the cu object right after deallocating memory. But when trying to grapple with it, the code turns out to be even more strange. Firstly, calling delete cu happens always — both in the condition and after that. Secondly, the code after the condition implies that the pointers u and cu are not equal, which means that after deleting the cu object it is quite logical to use the u object. Most likely, a typo was made in the code and the author of the code wanted to use only the u variable. When working with the realloc() function it is recommended to use an intermediate buffer, as in case if it is impossible to allocate memory, the pointer to the old memory area will be irretrievably lost. The Qalculate! project tops the list of the best free calculators, whereas it contains many serious errors. On the other hand, we haven't checked out its competitors yet. We'll try to go over all popular calculators. As for comparing with the quality of the calculator from the Windows world, the utility from Microsoft looks more reliable and well-worked so far. As usual, developers fixed a lot of code, but they said that there was nothing interesting) However, according to the results, we can make the following conclusion: developers make errors all over the code, but take much efforts to fix the critical ones. But if you used a static analyzer regularly — most of the problems would be detected at the earliest stage.